Wash, dry, and iron your fabric. Sew the fabrics wrong right sides together on both long sides and also one of the short ends. Turn fabric right side out (it should make a big sleeping bag). Iron the fabric around the edges so that it lays flat, then sew 1/2″ along both long ends and the short end that you already sewed together. This will keep the fabric from rolling into itself. Now comes the tricky part. Be sure to take your time with this part or you’ll be in trouble! Fold the unhemmed short edge of the fabric down 1/2″ and iron. I like to fold down the “outside” fabric, as shown below. Fold the same part of the fabric you’re already working with down 5″ and press. Open the 5″ fold and place both rings with the left hand corner of the fabric inside. Fold the corner through the rings so that the 1/2″ pressed line meets the 5″ pressed line. Ever so carefully, stitch a few inches at a time of the 1/2″ pressed edge to the 5″ edge. Note: I reinforced both ends of my stitching with a backstitch to add more security. Keep matching the pressed edges and sewing. You’re finished! 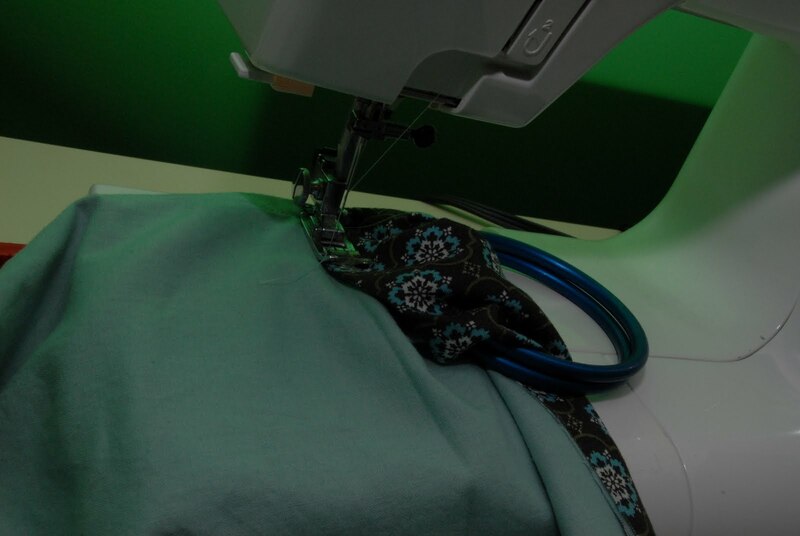 Check the length of your sling, fold up and stitch into place any excess. This can either form a pocket or just add a nice thicker tail that’s great for wiping up any messes. I also like the contrast it creates to have the opposite fabric against the front fabric. I suggest only using fabrics that are 100% of a particular material. Mixed fibers tend to stretch more (do NOT buy a stretchy fabric as it will not be safe! ), and are also less fire resistant. The rings that I use to make my slings are purchased from www.slingrings.com. They have undergone rigorous safety testing and come in a variety of beautiful colors. One can use aluminum or nylon rings, but I will only use the metal kind as I have more faith in them and like to use as little plastic as possible anyway. The great thing about Sling Rings is that the colors won’t wear off, and they’re safe for babies to chew on, too! Don’t purchase rings from craft stores–you won’t know how safe they are or are not. When choosing the appropriate sized ring to make your sling, I recommend using the “medium” size from Sling Rings. I’ve used both the small size for a single fabric sling, and the medium ones for a double fabric sling such as what these instructions are for. The medium size is more comfortable, provides security, and allows for easy adjusting. A big thanks to www.slingmemommy.com ! They are where I first found directions to make my ring sling. The directions in this tutorial are based off of theirs which can be located for free on their website. Also saw this on Whip Up – I love it! I think I may try it soon, as a gift for my expecting sister-in-law. This is fantastic! What a great gift idea. This is soo cute! I have two friends who are pregnant and I would love to make them each one. Are there any rough guidelines for sizing? Like certain measurements coordinate roughly with a clothing size? Beautiful! I'm making one today from gray linen. Can't wait to see how it comes out! Is there any sort of thread that you would recommend to make a really nice, strong sling? Thank you for this post! I made my baby a sling (due in August 2012) and I cannot wait to try it out. 🙂 Very awesome instructions. It says to sew the two pieces wrong sides together and then turn right side out….how is this possible? I'm guessing it must be a typo or I'm doing something wrong , which is typically the case. Either way, I usual fly by the seat of my pants and in the end, it all works out. Nanahoney – you keep one short side open. Then you sew it shut at the end when you are sewing to the rings. There are no typos in this one. What kind of fabric did you use in the one you used in this example? Don't use two layers of flannel… WAY too much material even for the “large” ring size. Also, the part that nanahoney asked was confusing for me too. It is definitely right sides IN. Otherwise, this tutorial makes for a great sling. Where would you find the rings? Can I make one recommendation? Please sew more than one seam to attach your rings. Three is ideal, but one is just a bit scary. It doesn't take but another couple of minutes to sew a couple more seams. I'm confused by the instructions also. It says sew wrong sides together, then turn right side out and sew. If it's wrong sides together, it's already right side out…. Do you sew it right sides together and then flip it, then top stitch? I think a couple of people above are just defining “right” and “wrong” sides in opposite ways :). Great tutorial, off to order some rings now! Thanks. why does it look sooooo long do u really need that much fabric? Just made my sling and this is a great tutorial! A couple of things – the medium metal rings from slingrings.com seem too small to me because using two fabrics just gives you SO MUCH fabric going through the rings that I can't smoothly adjust them while wearing the baby (which is kind of the whole point of a ring sling). Secondly, it's really long. The tail goes past my knee when my 21 lb. 10-month-old is snuggled in. So, there's definitely room to lose a little fabric if one wants. Otherwise, like I said, this was great and thanks very much. She meant to say sew right sides together I'm assuming. Too bad she hasn't corrected it, especially since its been linked to. Thanks for the comments, everyone! You can see how often I get back to posts to respond to comments. :-\ So sorry about that. It sounds like everyone managed just fine, but YES, I found the typo a lot of you mentioned about sewing the “wrong” sides of the fabric. It should indeed say to sew the “right” sides together, and I have corrected it, so thanks for pointing it out! I use the Gutenburg (I think that's what it's called) thread, and the fabrics I use are always 100% cotton. I think the sizing of your rings may change based on your fabric, and also whether or not you want to double the fabric or just do a single one. For summertime, I prefer a single layer sling! I am struggling to find a fabric that would be ideal for this. This might sound crazy. It can I use a 100% cotton bed sheet? And if so would I double it up or leave it a single layer? Rachel I just made a sling, using the large size rings and I am having a heck of a time adjusting it…its practically near impossible. I did a double layer kona cotton. Any tips? just wondering how long this rs can be used for. min-max weight or age? I'm having the sane problem! Used two 100% cotton fabrics (both from the quilting section, one a printed calico and the other was a Kona solid, I think), they didn't seem too thick by themselves, but even using 3″ rings, I'm having a heck of a time adjusting, even without my little one in the sling! Might end up taking it apart and just doing a single layer after all. For next time, are there any fabrics you've found that glide pretty smoothly? wow. This post is so nice and helpful to me. I was searching to buy ring sling but I will try to make one by the help of this post. Thanks a lot for sharing.